This is part two of the top questions to ask a plumber or heating engineer. If you haven't yet, be sure to check out part one! We've compiled these questions to show our desire and commitment to providing the best customer service in Oxfordshire. Missed part one? Find more top questions to ask a plumber here. Are You Flexible With My Schedule? For some heating and plumbing companies, especially sole traders, it can be difficult to work around your busy schedule. It is important to check that plumbers and heating engineers can be flexible to your schedule. M&N Heating & Plumbing has a dedicated customer care team that work tirelessly to project manage and schedule jobs. Our plumbers and heating engineers work 8am-5pm and can be flexible to your individual requirements, even offering a key exchange option. Furthermore, each job has its own unique reference number - enabling us to track and access the job throughout via our management system. This means we should never miss an appointment and that our customer care team can provide accurate information regarding the progress of your job. Who Will Be Completing The Work? Heating and plumbing companies often employ a range of different tradespeople, especially for large projects where a multi-skilled team might be required. You should ask who will be completing the work, and what level of experience and qualifications they have. We inform customers of who will be attending the job, providing peace of mind and assurance that the customer can check identification prior to entering their home. Furthermore, we are proud to operate our own apprenticeship scheme offering the opportunity for young, bright individuals to learn a trade in either heating or plumbing. Our apprentices will always work closely with a fully qualified engineer until they have completed their training. More information on our apprenticeship scheme can be found on our Recruitment page. Reputable plumbing and heating companies offer guarantees on the parts and labour they supply and fit. However, a guarantee is only as a good as the plumbing company that offer it. Therefore, it is important to ensure the company is trustworthy. 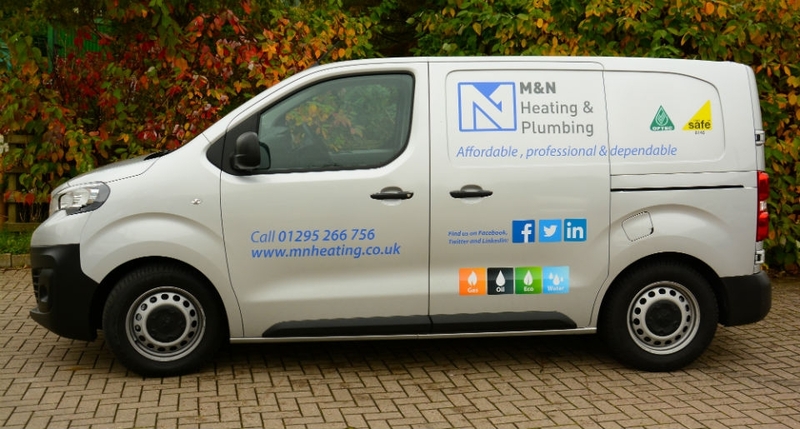 M&N Heating & Plumbing offer a 12 month no quibble guarantee, covering both parts and labour supplied and fitted by us - materials provided by the customer are not covered by this guarantee. This is additional to the manufacturer's guarantee that comes with the majority of materials we supply. In addition to a workmanship guarantee, approved installers should be eligible for manufacturer warranties. You should ask a plumber or heating engineer what warranties are available for the job. We are proud to be a recommended installer of Ideal gas boilers, which have reliability guaranteed with up to 10 year warranty available for certain models. Our dedicated customer care team can be reached on 01295 266 756 to discuss any warranty queries you may have. This may seem like an obvious question, but many tradespeople don't clean up once they've finished - leaving you with old parts, dust and dirt. You should always ask if a clean-up is included within the quote. We're a tidy bunch, and we understand how important your home is. That's why our plumbers and heating engineers take great pride in their work, and great care of your home - leaving it exactly how they found it. Furthermore, you'll receive a courtesy home visit within a week after boiler installation to ensure you're 100% satisfied! More information on our policies can be found on the Our Approach page. If you can think of any other important questions to ask a tradesperson before accepting a quote, be sure to let us know! You can contact us on Facebook, Twitter, email or give us a call on 01295 224844.